Today, Director Comey appeared before two separate U.S. Senate committees to speak on the Going Dark issue, a growing challenge to public safety and national security that has eroded law enforcement’s ability to obtain electronic information and evidence with a court order or a warrant. 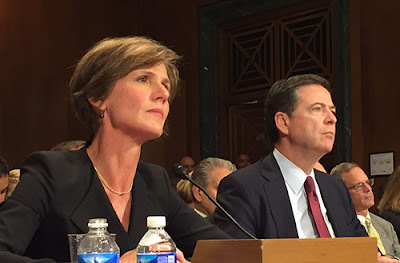 First, before the Senate Judiciary Committee, Comey—along with U.S. Department of Justice Deputy Attorney General Sally Quillian Yates—continued the public discourse on the Going Dark issue, which involves the impact of emerging technologies on the ability of law enforcement to use lawful investigative tools and follow critical leads. “The benefits of our increasingly digital lives,” according to Comey, “have been accompanied by new dangers, and we have been forced to consider how criminals and terrorists might use advances in technology to their advantage.” He said that the FBI is seeing a growing number of cases—from homicides and kidnappings to drug trafficking, financial fraud, and child exploitation—where critical evidence is coming from smartphones, computers, and online communications. Law enforcement at all levels has the legal authority to intercept and access communications and information pursuant to court orders, but it often lacks the technical ability to carry those orders out because of a fundamental shift in communications services and technologies. This scenario is often called the “Going Dark” problem. Make no mistake, the FBI supports strong encryption. The Department of Justice, the FBI, and other law enforcement agencies are on the front lines of the fight against cyber crime and as such we know first-hand the damage that can be caused by vulnerable and insecure systems. The government uses strong encryption to secure its own electronic information, and it encourages the private sector and members of the public to do the same thing. However, the challenges faced by law enforcement to lawfully and quickly obtain valuable information are getting worse. The Communications Assistance for Law Enforcement Act (CALEA) was enacted in 1994 and applies only to traditional telecommunications carriers, providers of interconnected Voice over Internet Protocol (VoIP) services, and providers of broadband access services. Today, thousands of companies provide some form of communication service, and most are not required by CALEA to develop lawful intercept capabilities for law enforcement. As a result, many of today’s communication services are developed and deployed without consideration of law enforcement’s lawful intercept and evidence collection needs. To help address the challenges posed by advancing communications services and technologies, the U.S. Department of Justice’s National Domestic Communications Assistance Center (NDCAC) leverages and shares the law enforcement community’s collective technical knowledge, solutions, and resources. NDCAC also works on behalf of federal, state, local, and tribal law enforcement agencies to strengthen law enforcement’s relationships with the communications industry.